I’ll admit: I was skeptical when I heard they were rebooting the Planet of the Apes series again after the mess that was Tim Burton’s attempted reboot, but most of that skepticism had to do with the decision to use entirely computer generated apes instead of modern makeup. I’ve typically been of the opinion that effects done practically are the best and that CG is often used excessively and done lazily. I also LOVE the original Planet of the Apes. It’s one of my favorite movies. But then I actually saw Rise of the Planet of the Apes and that trepidation vanished. Not only was the movie fantastic, but the decision to use CG apes was completely justified. What Andy Serkis and WETA had done was, in many ways, the evolution of their work on The Lord of the Rings, but they also imbued a sense of humanity and realism into the main character Caesar that hadn’t quite been seen before. It was brilliant. But when Matt Reeves was brought on to direct the sequel, again I was skeptical. Apparently, there had been drama, and for various reasons, Rise’s director Rupert Wyatt was not coming back. That’s almost never a good sign. But, just like before, once I actually saw Dawn of the Planet of the Apes, that skepticism was gone. This wasn’t some studio hatchet job that had been created as the result of interference and inflated egos. No. No, in fact, it was actually better than Rise, and the visual effects were even more special while still retaining that sense of unprecedented realism and humanity. There were even touches of Shakespearian-like tragedy thrown in for good measure. Now, with the new movie, my only reservation was that it couldn’t possibly live up to the other two, and yet again, that turned out to be completely unfounded. 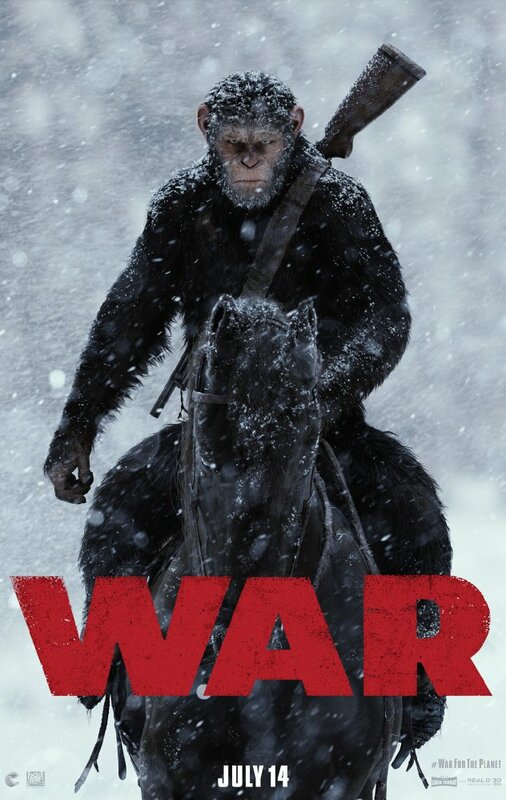 If anything, War for the Planet of the Apes might be the best of the new trilogy, and while I’m not quite ready to say it’s as good as the 1968 original, it definitely stands up there. The movie begins not too long after the last, in a world where most humans have died due to the “Simian Flu.” The remaining armies of the world are trying to kill all of the apes once and for all. They know of Caesar and believe that taking him out will throw the ape hierarchy into chaos, making them easier to dismantle and destroy. Some apes have even sided with the humans and now work alongside them, where they are demeaningly referred to as “donkeys.” These “donkeys” believe the apes will ultimately lose, and some even blame Caesar in how he handled Koba’s mutiny attempt (which was the crux of Dawn). Through a series of events, including a life-changing encounter with The Colonel, Caesar decides his people must move somewhere else where they can be safe, while he goes to deal with the humans himself. Reluctantly taking a small team with him, Caesar discovers that things are a bit different than he realized. He sees firsthand just how cruel the humans can be in their fight to not be eradicated from this world. Along the way, he and his team encounter a small, strangely mute child and a former zoo ape that has managed to survive through scavenging. Together, they will indeed partake in a massive war for the planet. Andy Serkis and Woody Harrelson are terrific as Caesar and The Colonel, respectively. What could have been a two dimensional villain in any other film winds up being a richly detailed and thoroughly fleshed out character that you’re never quite sure if you side with or not, and that’s mostly because Mr. Harrelson is able to beautifully run the gamut from one emotional extreme to the next. Likewise, Mr. Serkis allows us to see that even Caesar has flaws and doesn’t always make the best choices. He is constantly tormented by his past, and continues to have surreal visions of a bleeding Koba talking with him. Caesar’s anger may sometimes get the best of him, but his moral compass seems to always be in the right place. I’ve said it many, many times, but Andy Serkis deserves an Oscar for his acting ability here. Yes, the effects are amazing (actually, the best I’ve ever seen), but it’s all rooted in his pitch-perfect performance. I should also mention that Steve Zahn is fantastic as that former zoo ape, who calls himself “Bad Ape.” These movies always tend to be bleak, and his comic relief is much needed and appreciated without being too over-the-top. Actually, he nearly steals all of the scenes he’s in and that’s really saying something. Director Matt Reeves once again returns for this movie, and in a Q&A in New York before the movie premiered, he said that he was going for a biblical epic that starred apes. Indeed, Caesar’s experience does seem to mirror that of Moses, mixed in with a prisoner of war type movie. Some may find that blasphemous, but I thought it added to the already rich, woven tapestry of these films, and was certainly not out of place what with the original one’s dealing of evolution and religion and science. And given the way this movie ends, it’s an nice coda to this series, especially if this is to be the last… though something tells me it won’t be (especially if the rumors I’ve heard are true). How many times can you say for the potential 3rd sequel of a film franchise that has been rebooted twice now?